The second of the two competitions I wanted to mention was also run with help from the RIBA Competitions Service, and followed a year or so after the Elmswell competition (see previous post). 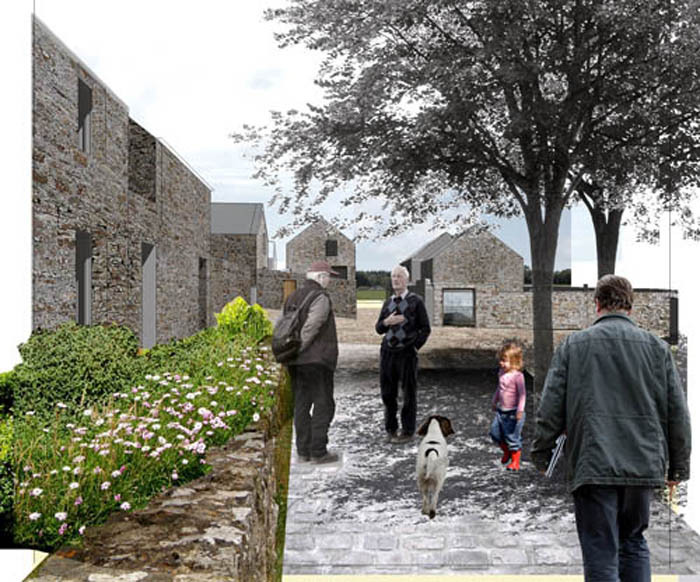 Like Elmswell, the competition to extend the village of Lawrenny in Pembrokeshire involved the design of new housing in a rural/village context, but the brief was more concerned with the overall sustainability and viability of the whole village. Again, a fascinating brief, which promised to produce something interesting and important – and it attracted a similarly high-powered shortlist of architects. The site was land owned by a single local farming family, and it was clear from the brief that they cared as passionately about the future of the village as they did about protecting the environment. The brief challenged the competing teams to think about sustainable design in the broadest possible sense, with particular emphasis on local food-production and water-economy. (Regular readers of Ruralise will understand why I think this is so interesting – read more here). Lawrenney Enterprises urged readers to look beyond the headline images to read Tom Russell’s full design report – which is good advice. It’s still up on their website, here. So, how did things turn out? Well, unfortunately the project rather hit the buffers, initially over the high level of affordable housing being demanded by the Pembrokeshire Coast National Park (which is the local planning authority) and then fell victim to the general economic down-turn. I spoke recently with Adrian Lort-Philips of Lawrenny Enterprises and he was bullish about the future of the project, confident that the National Park’s position will soften if the slump continues, and that they will eventually welcome such a major investment in their area. This entry was posted in Architecture/Design and tagged Adrian Lort-Philips, affordable housing, competitions, design quality, design/architecture, Elmswell, Lawrenny, local distinctiveness, materials, modernism, normal, planning, RIBA, simplicity, Tom Russell, village. Bookmark the permalink.